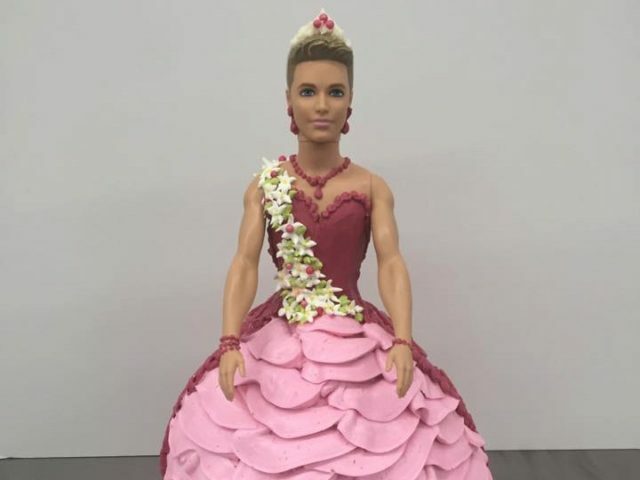 A customer ordered a birthday cake modeled after transgender Ken from Sacramento’s Freeport Bakery — complete with a pink dress made of frosting, a sash, a tiara, and jewelery. The bakery, which is known for its doll cakes, posted a picture of the doll cake on Facebook and started to experience a backlash, according to Marlene Goetzeler, co-owner of the bakery. “I started getting some negative comments … Then a couple days later I noticed there was a big dip in unlikes. I was kind of surprised,” said Goetzeler to KTXL. The post went viral on social media, but the bakery’s Facebook page lost dozens of “likes” and potential business as a result. “After posting this we had a ton of people unliking our Facebook page. I deleted the rude remarks, thank goodness not too many. Our customer was thrilled. Share this for us!” the company posted. The customer who bought the cake said the cake was meant to be for a friend’s birthday, according to KCRA. Chad Graham, a member of the party where the cake was served, said the cake was meant for someone who was not transgender and did not want to make a political statement. “I thought it was a little ridiculous. It was just cake,” said Graham.